In case you missed it, I was featured on Hairscapades yesterday for my Dry Bantu Knot Out. I wore that style for the day, then decide to take a nap. I tried the pineappling method, but with 3 pineapples since my hair is shorter. When I woke up later to go out, I decided to fluff and separate my hair and it came out fantastic! 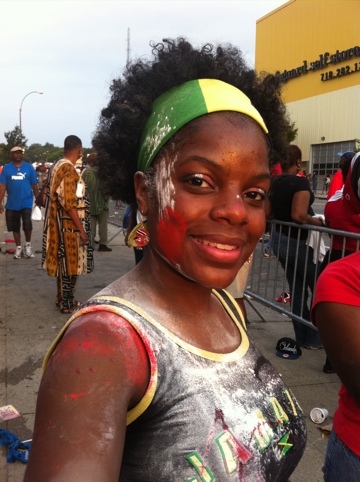 Don’t mind the fact that I’m messy, I was at j’ouvert for Labor Day weekend. For this week, I’ve been bunning. Today is actually day 3 having a bun. Honestly, I hate it. It’s just a plain bun, no pizazz. Maybe I’ll try something different next week. I’ve been dousing my hair with oil and then bunning it. It’s a mix of a few different types of oils and my hair is not even oily. My hair is sucking it up faster that I can put it in. I guess that answers my questions about why my hair felt so dry. I saw this on Fb and I totally LOVE this look on you!! it’s sooo cute!! I’m so intrigued now! Can’t wait to see this style!! LOL!! That’s so funny, because I was thinking of trying something like that soon. Well, more like cornrows in the front to box braids in the back (bigger ones) since the braid out came out so defined, but it was nice not to have to worry about my hair for a week. We’ll see. It’s been so long since I’ve done a TnC! But, I just did a style tonight that I want to try on a TnC. I took pics to post, but dropped my camera as I was about to walk out the bathroom … it’s broken!!! Aggghhhh!!! I have to go buy a camera now!!! Yeah, I read on FB about your camera. You can use the memory card in a different camera though, so all isn’t lost. Can’t wait to see the pics! I’ll prob post some pics of mine today.